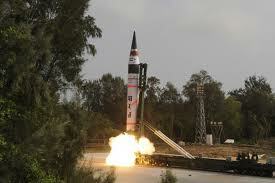 The launch of the Agni-V missile was hailed as a success. It’s actually an example of misplaced priorities. Behind the news media, politicians, and public celebrations of the launch of India’s new long-range missile, the Agni-V, there are some sobering realities the nation faces but is failing to address. While India now sports the capability to strike at the heart of China, it does so while neglecting some of society’s most basic needs. Just a week before the launch, the Supreme Court, in a majority ruling, gave the go ahead to the Right to Education Act (RTE) and ordered a mandatory reservation of 25 percent of seats in private schools for children from economically disadvantaged communities. The court, it seems, felt that the government doesn’t have the wherewithal and required infrastructure to take care of the education of India’s children. When we can’t take care of our own children, when we fail them in providing basic education, how can we claim to have reached an “elite club” by firing off a missile and wasting precious resources? We fail to hone the talents, the skills and interests of youngsters because of the paucity of educational facilities. Shouldn’t we instead prioritize establishing world class educational institutions and giving people an opportunity to realize their potential? Global surveys of the world’s best universities rarely, if ever, feature Indian universities. Shouldn’t this be an elite club that we focus on gaining entry to? After all, what would benefit India best in the long run? Indian towns and cities are crying out for infrastructure improvements. Yet this country falls short of providing electricity to a large section of the population. You don’t need to go to Bihar and other poor regions to see the pathetic condition of the electricity supply – you just need to venture just outside the capital. It’s a genuine tragedy that over the last six decades, India hasn’t been able to tackle something as basic as providing power to people’s homes and businesses. Indeed, the village where I was born still gets no more than four to five hours of electricity supply a day on average. Should these people also feel proud that we have a strategic “asset” like the Agni-V? Also, by launching such destructive weapons, New Delhi betrays an anachronistic mindset, a “Cold War” point of view. India’s decision to test such a missile hardly suggests a progressive worldview. There are, of course, those analysts and policymakers who argue that India lives in a tough neighborhood and so mustn’t ignore its own security. They argue that such military achievements buttress India’s aspiration to play a larger role internationally. But they forget that without addressing the real issues at home – without addressing the most basic needs of its population – having such weapons will fail to make life better for the average Indian. And that is surely what a government is meant to be for. India took a big leap forward with the launch of the Agni-V missile. But it complicates ties with China.